Naturalization ceremonies are taking place across the nation. 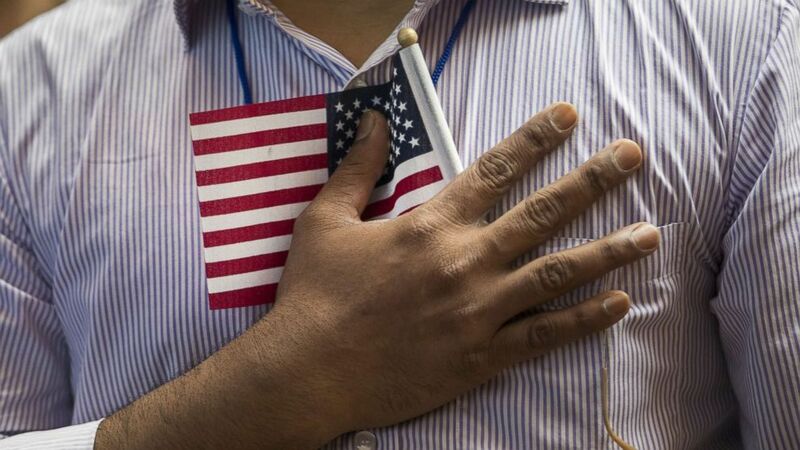 This Fourth of July, nearly 14,000 immigrants become America’s newest citizens, swearing the oath of allegiance at 27 naturalization ceremonies across the nation that coincide with the country’s 242nd birthday and the signing of the Declaration of Independence in 1776. Wednesday's ceremonies come on the heels of a July 2 report from NPNA claiming an 88% increase in the backlog of U.S. citizenship applications since 2015, in addition to an ongoing immigration crisis that’s drawn nationwide protest. The number of people becoming citizens between June 28 and July 10 marks a slight decrease from last year, when nearly 15,000 people took the oath, according to U.S. Citizenship and Immigration Services (USCIS), but a sharp increase from 2016, when about 7,000 did so during the same time period. "If willing to honor our system of laws and adhere to its faithful execution, the great privilege of citizenship is attainable for many legitimate petitioners each year seeking greater opportunity, prosperity, and security as newly entrusted American citizens,” USCIS spokesperson Michael Bars said in a statement. Cities participating in Fourth of July citizenship festivities include Philadelphia, Denver, and Tucson – each with its own tradition to celebrate America’s newest citizens. (Drew Angerer/Getty Images) Mosammat Rasheda Akter, originally from Bangladesh, holds her 7 month-old daughter Fahmida as she recites the Pledge of Allegiance after officially becoming a U.S. citizen during a naturalization ceremony at the New York Public Library, July 3, 2018. 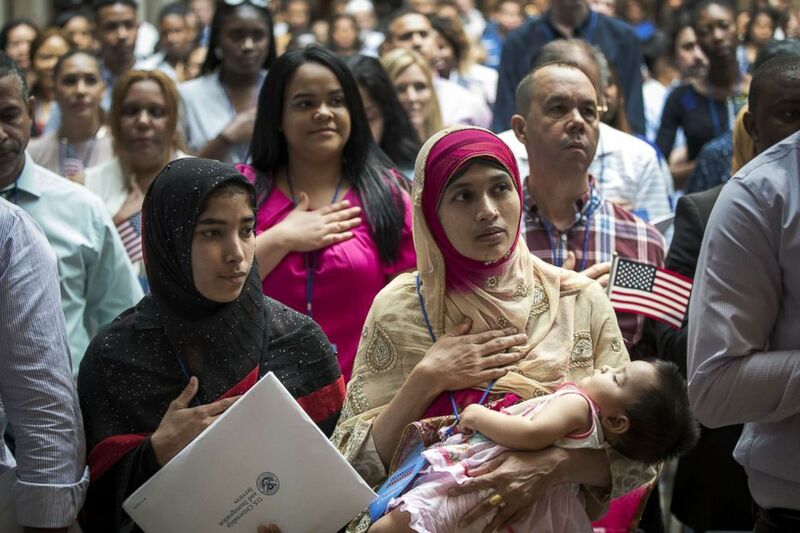 200 immigrants from 50 countries became citizens during the ceremony, one day before America's Independence Day. Just 70 miles from the U.S.-Mexico border, Tucson would be celebrating 21 new citizens at a ceremony Wednesday in Saguaro National Park. Juarez noted that as the son of Mexican immigrants, he has a personal connection to stories of citizenship. Juarez hopes that celebrating citizenship in a national park will help new citizens recognize the value of America’s public lands. In Philadelphia's Betsy Ross House – another historic landmark – the Daughters of the American Revolution would be hosting a children's naturalization ceremony. “Every year, we celebrate 13 children – who each represent the 13 original colonies – at our ceremony. The Children of the American Revolution read out the colonies’ names and ring a bell in the order they joined the Union as each child comes up and receives their citizenship certificate,” Patricia Coyne, a regent of the DAR chapter, told ABC News. Coyne said the ceremony "brings tears to [her] eyes every time as the children of America’s first patriots welcome America’s newest children." Meanwhile, Denver will welcome 30 new U.S. citizens from 18 countries Thursday. “[The ceremony] reaffirms our city’s emphasis on celebrating immigrants and recognizing their hard work and journeys to become citizens,” Jamie Torres, the director of the Office of Immigrant and Refugee Affairs for the City and County of Denver, told ABC News. Torres noted that Denver is also launching a campaign to provide resources to permanent residents and encourage them to apply for citizenship. Torres’s favorite part of naturalization ceremonies is finding a “connection” between herself and the new citizens. “Even if I don’t know them personally, I feel a closeness to them,” she said. Rebecca Shi will never forget the day she became a U.S. citizen. And just last Thursday, she watched her mother take the oath of allegiance after 25 years of an “arduous journey” on the road to citizenship. Shi explained that her mother, a Chinese doctor, came to the U.S. on a visa from Shi’s father, but a court error led a judge to incorrectly rule that Shi’s mother had overstayed her visa. After appealing to Rep. Luis Gutierrez, D-Ill., Shi had the deportation order reviewed and canceled in 2013, paving the path to her mother’s citizenship. “My mom finally has the opportunity to fulfill her profession in the medical field, mentor the next generation of doctors, and fully reach her potential,” she said. (Drew Angerer/Getty Images) A new U.S. citizen holds a flag to his chest during the Pledge of Allegiance during a naturalization ceremony at the New York Public Library, July 3, 2018, in New York. Shi recalls her mother studying for the citizenship test “every single day for eight months” and learning English through classes at a high school and community college. But her hard work paid off. “She got 100% on the test,” Shi, who attended her mother’s citizenship ceremony last week in Chicago, said. Shi, who now serves as the executive director of the Illinois Business Immigration Coalition, a group that advocates for federal immigration reform, said she believes the “stakes are higher” today for people hoping to become citizens. “Immigrants come here to work hard and be the best in their field, though some people call them ‘lazy.’ So, we need to fully participate in our communities. And despite the rhetoric coming from [the Trump administration], we are still a democracy,” she said. Shi said she encourages people to apply to become citizens, study for the citizenship test, and “save up” to pay the $730 application fee. “People who step up decide the direction of our country. So I encourage people to become citizens, register to vote, and vote,” she said. And Wednesday, Shi’s mother partook in another kind of civic engagement: she and her daughter would be marching in her first Fourth of July parade as a U.S. citizen.